Red-Winged Blackbirds in their own territory will show off their epaulettes, whereas when they are outside of their own territory they will often hide, or show very little of their epaulettes. Epaulettes refer to an ornamental shoulder piece often seen in military uniforms where they are worn to signify status, acting as a visual cue for attention. But humans are not the only ones to use this strategy. 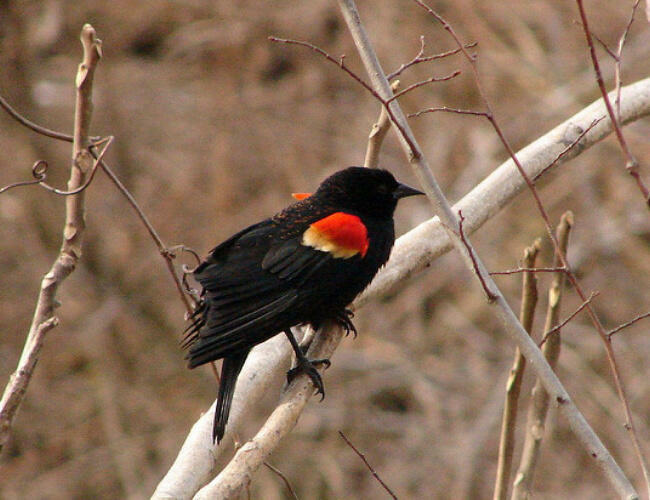 The term epaulettes also refers to the bright red badges on male Red-Winged Blackbirds. Research has found that the epaulettes are part of the birds communication, and helps them to establish and maintain their territory.